Is foot arch pain stopping or affecting your ability to exercise, work and wear your favourite pair of shoes? Foot arch pain, also referred to as arch strain, is a common burning, painful condition affecting the arch area of the foot. The arch facilitates the even distribution of body weight from the toes of the foot to the heel. Severe strain to this area can cause foot arch pain which can then restrict foot movement and make the undertaking of normal daily activities difficult and painful. If you would like to learn more about Plantar Fasciitis and discover how the OSMO Patch can relieve the pain and inflammation associated with a medical diagnosis of this condition then please click on link below to learn more. 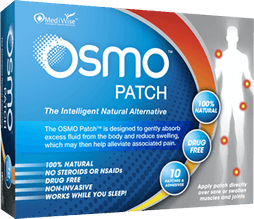 The OSMO Patch together with proper rest supports the reduction in swelling, inflammation and the associated pain in the foot of the arch due to medically diagnosed Plantar Fasciitis.